Where do you need the most help at work? What more would you like to get done in your workday? The survey is about techniques in 7 important areas that can help your nonprofit run better. We need your input about which ones are important to you! 3 Minutes Tops: We are asking you to check a few boxes in a survey about techniques that can both help your nonprofit run better and make managing your job more efficient. These can be job tasks that you need to perform: where to find the time to do them all? They could be new ideas that you realize can improve results: how to get started? Or, they can be routine program activities that you’re currently doing: how to increase their impact? The survey asks which techniques discussed in these 7 core areas can be the most helpful to you. Check as many boxes as you like in these themes! Please write us with other ideas. Simply use the survey’s optional text boxes or contact us directly. It is anonymous. We will not collect your personal information-nor share it with anyone-nor will we contact you individually. Thank you for participating in the survey. We look forward to your insights! We will be releasing a compilation and analysis of everyone’s great input in next month’s newsletter. Be sure to subscribe to our newsletter so you don’t miss the report. We would live to hear more from you. Please feel free to Contact Us. MORE INFORMATION: Do you like the ideas discussed in the survey? Then subscribe to our informative and educational newsletter. In last month’s newsletter—Nonprofit Interviews: Challenges, Solutions & Funding—I wrote about 16 non profit organizations that I interviewed in California. I wanted to see firsthand what challenges this range of nonprofits was facing and what goals they were hoping to achieve over the next 12 months. I published a detailed list of the results in the newsletter. I did this because I wanted to make sure that our September training workshop—Designing and Funding Non Profit Programs—will maintain an updated and current step-by-step process in helping them reach their goals. In this month’s pair of newsletters I want to introduce you to the people and the organizations that I spoke to. This is Part Two: organizations working with community development, social justice, education and social services. In last week’s Part One I introduced you to organizations working with food and hunger. These people are representative of the people you will meet if you attend the September workshop in Claremont, California. Click on the links below to learn more about these wonderful organizations. They are the best of the best! Sustainable Claremont is a non-profit 501(c)3 organization which was formed to provide educational resources, to engage in advocacy, and to take actions which move us towards sustainability, not only within Claremont but beyond our borders. We are independent of the City but work in cooperation with it and with other organizations. I met with Sustainable Claremont’s coordinator Alexis Reyes in May. She described how they run projects through Action Groups. One of her major goals this year is to reduce energy use citywide through their 2-year Claremont Energy Challenge. Through their Urban Agriculture Program, Fiddleneck Family Farms, unemployed immigrants with farming expertise, whose children are in our program, are employed raising organic fruits and vegetables for the Los Angeles County and San Bernardino County markets. Their Teen Green Program is a youth-led environmental group made up of students from the Connect to College Mentoring Program. Executive Director Gloria Killian. Action Committee For Women In Prison.Our mission is to advocate for the humane and compassionate treatment of all incarcerated women everywhere. We work for the release of all women who are unjustly imprisoned, and strive to reduce the over reliance on incarceration. We work to bring fairness and equity into the criminal justice system and to shift the focus to treatment and restorative justice. We work to educate the public, develop new legislation, implement new programs, and develop resources for incarcerated women. It is our vision that all persons who are impacted by the criminal justice system will be treated with dignity and respect, and that restorative justice will be the goal of all parties. Their Annual Christmas Project: Christmas packages to 5,000 women in prison in California. For the past 11 years, The Action Committee for Women in Prison and All Saints Church Episcopal Church have joined together to provide small gift bags for the 2,500 women imprisoned at the California Institution for Women. These gift bags are the only holiday gifts that women in prison receive. This year we are delighted to announce that ACWIP is partnering with the Los Angeles County Sheriff’s Department to include the 2500 women incarcerated in the Los Angeles County Jail System, for a total of 5,000 gift bags for incarcerated women. Pomona Hope’s programs include an after-school program for kids in first through twelfth grade. Each day includes a snack and recreation time, homework/reading time, customized tutoring in Math and Language Arts, Gym Games, and Computers or Art time. Their Arts Program fosters self-expression and community growth through the visual and performing arts. Other programs include parent and skill building, internships and job training, community organizing and a community center. Executive Director Emily Budiyanto has goals for this year for increasing staffing to include a volunteer coordinator and a parent liason. In 2010 Pomona Hope leased an empty lot across the street from the Community Center of the First Presbyterian Church of Pomona for a Community Garden. In 2011 the garden was dedicated to the neighborhood as the Center Street Community Garden. The 1/3 acre garden has 51 garden plots; 1/2 of the participating families are from the immediate neighborhood. Barbara provides classes on food and gardening for kindergarten students through 8th grade. She has been successful in getting annual supplies donated from corporations like Home Depot. Inland Valley Hope Partners believes in feeding the hungry and sheltering the homeless—and they serve people in a dozen cities. They run four food banks, provide emergency housing—and run a farmers’ market and a gleaning program where backyard gardeners can donate extra vegetable production to Hope Partners clients. Hope Partners’ Director of Development and Communication, Kami Newman, feels that a major goal is to help move people forward to independence. She also feels that quantifying program impact is important and recommends an impact measurement system developed by United way. When we met in May she was just completing the final details for a fundraising golf tournament with 144 golfers! 2 weeks pre-workshop. Guided Field Data Collection: Community Needs Assessments. Conduct a needs assessment with a community where you work in preparation for use in the workshop—guided through distance learning by CSDi staff. We will provide all of the tools and information you need to conduct the needs assessments. 2 optional field days. Don’t have community access? Participate in two optional field days the Saturday and Sunday prior to the workshop conducting a participatory needs assessment with our local partner near the workshop venue. 5 days. A Face-to-Face Workshop. Full Project Design and Development. Working with the CSDi workshop leader, you will use your needs assessment to begin the development of a complete, fundable, launchable project. Detailed information and logistics. Visit the Non Profit training program page to find full, detailed information, logistics and a syllabus. We look forward to working with you in our training programs. 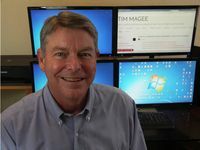 Tim Magee is the author of A Field Guide to Community Based Adaptation published by Routledge, Oxford, England. Would you like to subscribe to this newsletter? In this month’s newsletter I want to introduce you to the people and the organizations that I spoke to. This is Part One: organizations working with food and hunger. Next week in Part Two I will introduce you to organizations working with community development, social justice, education and social services. Maria Seja, garden plot holder at the community garden. Initiated in 2010, the 4 acre Huerta del Valle is a community garden and urban agriculture project in Ontario that has grown out of collaboration between the Pitzer in Ontario Program and local community organizations. The project is supported by the City of Ontario and a partnership of organizations working to improve community health through comprehensive environmental, educational and policy strategies. Currently, 52 family plots are being managed, along with communal growing areas and a two-acre urban farm that grows vegetables for selling. Huerta del Valle also provides on-site community education courses. The Pitzer in Ontario Program is the Center’s local partner for our upcoming training workshop in September. Workshop attendees will be able to work with Arthur Levine—Pitzer in Ontario Community Garden Coordinator—lead a participatory needs assessment on Saturday the 19th with members of the Huerta del Valle community garden. A volunteer at Earthworks Farm. Earthworks Farm is a 4.9-acre work-training and educational urban farm located in the beautiful Whittier Narrows Recreational Area, east of downtown Los Angeles. Earthworks Farm facilitates multiple education programs benefiting the surrounding communities. These programs include workshops in organic farming, farm-to-school education, Harvest Tours, CSA, Farm-to-Table and volunteer opportunities. Earthworks Farm uses organic farming practices and grows a diverse array of crops. The mission of Earthworks Farm is to grow organic produce, promote local and sustainable agriculture, teach organic farming to community members and support a lifestyle of healthy eating and active living. Program Director, Marianne Zaugg, runs the farm with three employees and 10 to 15 volunteers. Volunteers who work 2 hours a week receive garden produce and volunteers who work 4 hours a week get a garden plot. Tim Constantine with his onions. The Constantine Family Garden and Orchard was established in 2012 by Tim and Peggy Constantine at his former family home in San Dimas. It was established to grow and harvest fruit and vegetables to be distributed in partnership with the Inland Valley Hope Partners at their food banks. The garden and orchard has provided many pounds of organic fruits and vegetables to their four pantries since the summer of 2012. The garden runs with volunteer support of the Claremont United Church of Christ, Damien High School, the University of La Verne, the Claremont Colleges, The Charles Foundation, and the TreePeople of Los Angeles. In the 1/4 acre garden, in the first year they produced 2,000 pounds of produce, 2,300 the second year, 2,800 the third year and hopes for 3,200 this year. Tim believes in growing what clients of the Inland Valley Hope Partners food banks want. Barbara Evans, Garden Coordinator for the organization Pomona Hope. In 2010 Pomona Hope leased an empty lot across the street from the Community Center of the First Presbyterian Church of Pomona for a Community Garden. In 2011 the garden was dedicated to the neighborhood as the Center Street Community Garden. The 1/3 acre garden has 51 garden plots; 1/2 of the participating families are from the immediate neighborhood. Barbara provides classes on food and gardening for kindergarten students through 8th grade. She has been successful in getting annual supplies donated from corporations like Home Depot. Rishi Kumar at their Pomona urban farm. Sarvodaya Farms is a project of The Growing Club, a community organization dedicated to educating community members about the natural solutions to the world’s (sub)urban problems. Learn more about their classes, workshops, free videos, and more on their website. Isaac Vega and a volunteer at the Claremont Satellite Food Pantry. Inland Valley Hope Partners believes in feeding the hungry and sheltering the homeless—and they serve people in a dozen cities. They run four food banks, provide emergency housing—and run a farmers’ market and a gleaning program where backyard gardeners can donate extra vegetable production to Hope Partners clients. Isaac is the Food Security Program Manager—and his program provides food to between 150 and 200 families a month. He has been successful in receiving regular donations from a USDA commodities program: Feed America. Hope Partners’ Director of Development and Communication, Kami Newman, feels that a major goal is to help move people forward to independence. Consider meeting like-minded people like your self by attending our Designing and Funding Non Profit Programs workshop. Our 25 Most Useful and Informative Newsletters. New for 2019: Non Profit Trends Survey. We need your ideas! Don't you want your project to work? Evidence based solutions are key. Do you feel client input is important in nonprofit program design? Search for topics at top of page. Copyright © 2008-2019, Center for Sustainable Development, Inc. All rights reserved. CSDi is a U. S. registered 501(c)(3) non profit organization.